As of December 2003, the number of the current 994 analog stations in the 470 to 800 MHz frequency range was increased by 1129 DTV stations, with a high number of DTV permitees not yet on-air. This created an overcrowding of the UHF stations, resulting in undesired adjacent and co-channel interference, affecting the reception of the grandfathered analog UHF stations, as well as the ever growing number of operational DTV stations. Co-channel and adjacent channel interference became the norm, not the exception. 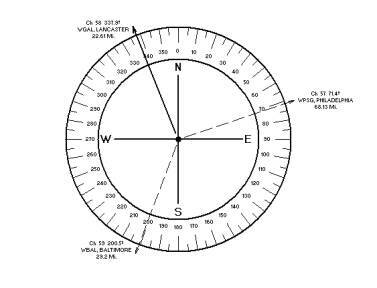 Signal Direction Sheets represent the most convenient format to display and analyze interference conditions. Computer developed interference signal direction sheets, which can be created for any VHF or UHF channel, render accurate and visible presentations for fast interference analysis, the basis for an efficient antenna-array design. The signal direction sheet below shows adjacent channel interference conditions for the reception of Channel 58, WGAL-DT, Lancaster at the Fawn Grove, Pa. antenna-site. A potential adjacent channel interference is clearly demonstrated: Channel 59, Baltimore, a DTV station, is received from almost the same distance as the desired Channel 58, WGAL-DT, Lancaster. 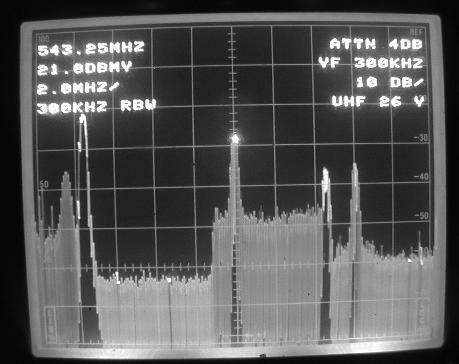 The computer-aided study was the precursor for the on-site signal survey verifying the presence of a strong adjacent channel interference, as shown on the screen of the spectrum analyzer below. The Channel 58 spectrum is in the center of the screen. Adjacent channel interference Channel 59, Baltimore appears on the right at a level 15 dB below the Channel 58 amplitude. No UHF traps or bandpass filter could protect the desired Channel 58, DTV reception against the, 4.5 MHz wide adjacent power spectrum. To expect a trap and bandpass filer will eliminate the interference is a serious misconception. A pair of horizontally stacked Channel 58 Yagis was recommended, with H =10” horizontal spacing, to force a deep radiation pattern null into the direction of adjacent channel CH 59, Baltimore. Another frequently encountered situation is discussed below. The FCC requires the simultaneous operation of the grandfathered analog UHF station and its DTV affiliate, creating a delicate adjacent channel interference situation. 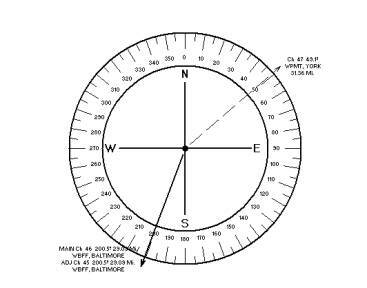 The adjacent channel interference signal direction sheet below shows that signals from Channel 45, Baltimore and its digital affiliate Channel 46, WBFF-DT, Baltimore, arrive from the same distance and direction. 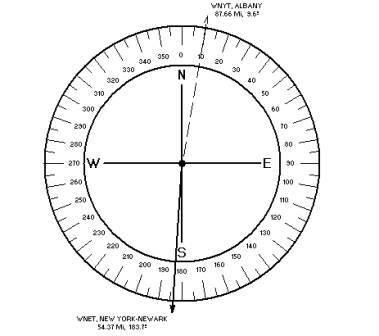 Interference conditions were further aggravated by nearby Channel 47, WPMT, York, from a distance of less than 32 miles, but a relative angle of 151 degrees. Will the strong, 1292 kW effective radiated power Channel 45 analog signal overwhelm the DTV channel, causing undesired artifacts in the HDTV picture? Can the applied parabolic antenna provide adequate protection against the York signals, arriving from a relative angle of 151 degrees? 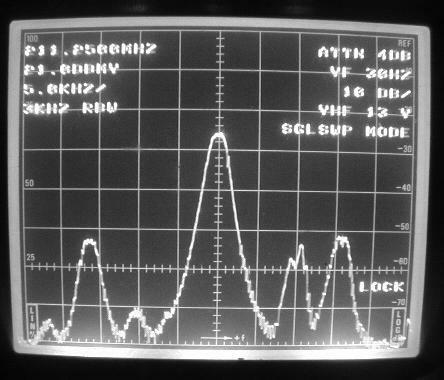 This picture, taken from the screen of the spectrum analyzer, shows the desired flat-top Channel 46 digital spectrum in the center of the screen. To the left, the Channel 45 analog spectrum appears with a 22 dB higher video carrier level. Not a trace of Channel 47, York spectrum. The parabolic antenna was proven an effective interference rejection tool. Since the Channel 45 analog signals came from the same direction as the Channel 46, transmission, (the stations are co-located), the parabolic could not reject the Channel 45 signals. On the other hand, all was not lost. Analog video and sound carriers can be reduced by using a combination of traps and bandpass filter. The protection of analog TV reception against co-channel interference offenders has been well established and practiced by CATV engineers in the past four decades. In the case of HDTV co-channel interference, when the offender can be either an analog or DTV transmitter, that well established analog protection technique may not work. 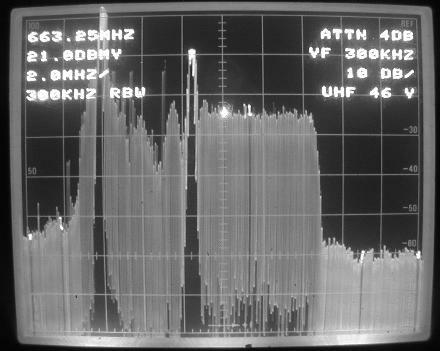 Observe the picture below taken from the screen of the spectrum analyzer. It is a classical analog interference case. 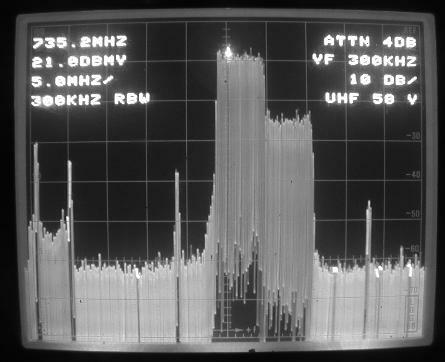 The desired video carrier is in the center of the screen, accompanied by a -10 kHz beat two divisions to the left, and a +10 kHz beat two divisions to the right. The tall +10 kHz beat on the right positively identified the dominant interference source. In the case of digital co-channel interference there are no ±10 kHz or ±20 kHz beats in the 4.5 MHz wide digital power spectrum. A typical case is presented below. In Fawn Grove, Pa. the desired Channel 26, WETA, Washington, D.C. reception was affected by signals from Channel 26, KYW-DT, Philadelphia. The flat top digital spectrum of Channel 26-DTV, Philadelphia is firmly embedded between the video and sound carriers of the desired Channel 26, Washington, D.C. spectrum. There are no offset beats in the spectrum. Nor will the Washington, D.C. picture exhibit Venetian Blind type lines in the picture. The digital co-channel interference appeared as a significant noise increase in the desired analog picture. An even more disturbing aspect can complicate HDTV co-channel interference conditions. At many locations, where in the past the desired VHF or UHF station was exposed to a single interference source, or no interference at all, the new HDTV stations may critically change the situation. 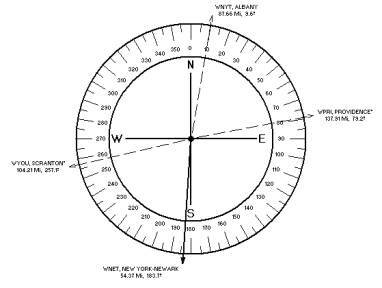 The co-channel signal direction sheet above, prepared for the reception of Channel 13, New York, shows Albany, N.Y. as the only co-channel interference source before the advent of DTV stations. Not anymore. Two upcoming HDTV stations, WYOU-DT, Scranton and WPRI-DT, Providence raised the danger level to a total of three (3) potential co-channel offenders, as presented on the signal direction sheet below. Perhaps an extreme case, but the signal direction sheet shows what can happen these days when analog and their DTV stations are forced to operate simultaneously.